“I’m here to visualize “energ-gender.”” That’s how Oladeji Lawal, 27, Spaces for Change’s (S4C’s) Graphic Designer describes his ideas to use graphic art and bespoke imagery to visualize and communicate Spaces for Change’s research information on gender and energy. ‘Deji just joined S4C in September 2015 to bolster the organization’s Gender and Energy Policy Research Campaign. He studied Computer Science at Lagos State University. “Visualizing hard data and research information is very critical. Sometimes, people who need very important information miss out on the opportunity because the data is in a form that they cannot either access or understand. Ever since my mother died from health-related complications when I was still a child, I always feel her life would have been saved if we had access to important information about early detection, preventive and curative approaches to maternal wellbeing. I try to put everyone in my shoes, and constantly think of ways of simplifying information in a way that most people who need it can find and connect with. That is my own way ensuring other peoples’ mums live longer than my mum did. Whether they are cooking at home or frying akara and puff-puff by the roadside, women need energy 24/7 to function effectively as wives, mothers and caregivers. In the same vein, as a young designer in my twenties, I know the youth now live in a digital world and the fastest way to reach out to them is by putting sharp-and-smart information on digital spaces where they can quickly access, view and download it via their smart phones, ipads and other electronic devices. From my experience, it is the women and the youth that are affected the most when empowering research analysis and empirical data regarding economic empowerment and physical wellbeing are boxed up in high-level reports that contain many complex words and jargons. That is why I am here. I want to use this opportunity to contribute my quota to gender equality and youth empowerment,” Oladeji said during his first interview. 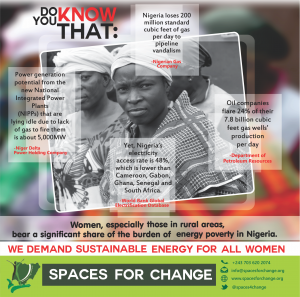 At his second interview, he came with finished products of three bespoke images visualizing excerpts from Spaces for Change’s yet-to-be-published research report, A Gendered Analysis of the Petroleum Sector Reforms.” At this point, we knew he was the one we’ve been looking for. We are so proud of this hire. Spaces for Change is an organization that built its reputation from crowdsourcing information from the social media. We are enthusiastically taking our crowd-sourcing activities forward by visualizing Energ-gender, using graphic imagery to strengthen the organization’s online presence, while expanding our penetration and reach to wider audiences on digital spaces and public networks.